The Midnight Half is really starting to get interesting. This race used to be made up of a small community of local runners, but in the last couple of years its reach has attracted many new people. When I caught up with the lead female at checkpoint #2 in Red Hook, I wasn’t surprised that I had never met her before. Featured photo of second place female Cara Notorianni (1:26:41) crossing the Manhattan Bridge by Izzy Cohan. As we left the Brooklyn Ice House and made our way towards the Brooklyn Bridge I had so many questions, having never met Cara. I asked her what her name was..she replied inbetween breaths. Then I started to ask more questions, forgetting she was in the middle of a race. When I calmed down I realized it was best to leave her alone. I was very excited to have a first-timer in the lead, tearing it up through Red Hook. I followed her as far as I could..she took off hopping fences and running through parks. I met back up with her on the Brooklyn Bridge and followed her back into the LES towards South Street. It was somewhere after the 3rd Checkpoint that Cara made a wrong turn heading towards the Manhattan Bridge, and it cost her some time. This turned out to be a big mistake creating an opportunity for Jennie Cohen to grab the lead..which she did. Jennie held on to it for the remainder of the race. All things considered, Cara had a great run for her first Midnight Half -2nd place with the field we had this year is pretty impressive. Its been great hosting her for the Midnight Half and the OSR Women’s 10K, she is very talented and an exciting competitor to watch. I am very much looking forward to her next Midnight Half. Cara heading towards the the Brooklyn Bridge after checking in at the Ice House. 1. How did you first find out about the Midnight Half? What had you heard about it? Pat (Casterline, overall winner) sent me the Eventbrite link a few weeks before the race and I was instantly interested. I really didn’t know much about it, besides the fact that it was at an absurd hour and had a sick after party. I didn’t even realize that there wasn’t a specific course until the e-mail with the checkpoints listed was sent out the week beforehand. 2. Why did you sign up, did you think you were capable of winning? Did you know any of the female competition prior, if so, who and what? It seemed to be such a unique race atmosphere that I was enticed to check it out. Plus, I had just run my first half marathon in April and fell in love with the racing distance, so I was itching to do another. I thought I’d be able to maybe sneak into the top five, but didn’t cross my mind that I’d be in contention for the win. I really had no idea what the competition would be like. I briefly checked out the results from last year, but didn’t read too much into it, since I was unsure of how the race played out. I felt capable of running close to the top times at a typical, smooth road race, but knew the Midnight Half didn’t cater to that. Factoring in traffic, pedestrians, and the occasional road divider to hop over made the race a bit of a wild card. 3. I know you like to run trail and elevation, given the urban context of the Midnight Half how did your background come into play with a 4-bridge-route and the variations in surfaces between the checkpoints? I tend to thrive on more technical courses, with hills and on trails – they seem to even the playing field a bit. I don’t have raw leg speed, but I have a fair bit of strength (or so I like to think). 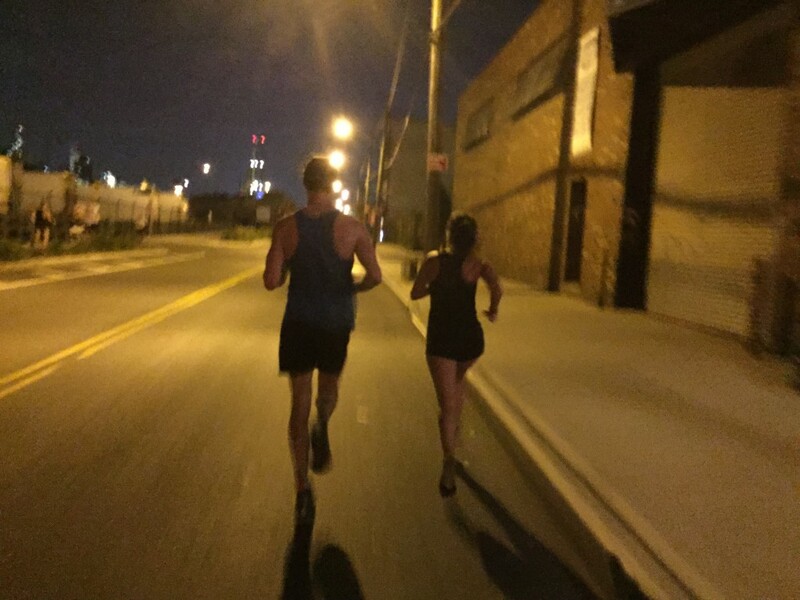 Surprisingly, the Midnight Half mimicked a cross country course or a trail race in a way. The four inclines served as an opportunity to tap into the hill training I had been doing over the spring. 4. What shoes did you wear to the race? Why? I wore the Nike Flyknit Racers. Even though it was my first time racing in them and only my second time running in them, I was confident that they would do the trick because they hug my foot well and give enough support for a longer race, while still boasting a low weight. 5. What, if anything, surprised you about this race format (level of competition, check point format compared to set route, nighttime, open course with no street closings)? All of the above. For a chill race kept a bit on the down low, some seriously great competition on both the men’s and women’s side showed up, which was great. I love everything about the checkpoint format. It ensures that, in order to be successful, you need a lot more than pure speed. It also leaves room for creativity and a chance to mold the course to one’s personal strengths, in a way. The fact that the race was on an open course at night added a total badass (am I allowed to say that?) component. Personally, I didn’t feel like I was racing, but participating in an extreme obstacle course. 6. You and the overall winner Pat Casterline are pretty good friends, I know you rode the course together the night before in preparation, did that conversation and bike ride make a significant impact on your run? What did you guys talk about? What else did you do on your own to prepare? I actually had no idea who Pat was until after the race. Just kidding. Pat and I ran in college together and he’s a great friend. (By the way, I was thrilled to see him kill it! I wasn’t surprised, in the slightest, since he’s very fast and was really well prepared, but thrilled nonetheless.) We rode the course late the night before. I borrowed my sister’s bike (a glorified beach cruiser) and by the end, I was riding on two flat tires. I don’t know what was more of a challenge – dragging it up the bridges or getting it to and from the start via subway from 168th. During the ride, I kind of just followed along, having had no idea where I was. I tried my best to visualize the run and soak in Pat’s well thought out and specific directions. We compared different possible routes to figure out if it would be best to take the smoother vs. shorter way (Actually, Pat did this. I just nodded along.). If we didn’t do the ride the night before, I’m pretty confident that I would still be lost out in Red Hook today. After the ride, I knew I had some serious work to do the next day, so I spent a lot of time examining the course and writing down each turn. I also virtually “ran” the course on Google maps. 7. What was your race strategy going in, did you stick to it once the race started or did it get thrown out the window once the start happened? My strategy going in was to simply run my course as fast as possible, despite what others did. I knew this would be a challenge, since my inclination would be to just stick with the leaders. I actually did stay on strategy for the majority of the race – until about mile 11 or so. I second guessed my route and followed a nearby racer. This led to me getting even more confused and losing some time. 8. I caught up with you at the second checkpoint in Red Hook, you were the lead female at that point. Right after the 3rd checkpoint you made a wrong turn and lost the lead. Can you describe the difficulties of navigating through an unmarked urban course like this, not knowing how far behind your closest competitor is, and knowing that every move and every second could be the difference between 1st place and not 1st place? It’s strange, because out on the course, I kept seeing runners, but had no idea if they were ahead or behind me – or, if they had gone through the checkpoints or not. It was a constant mental struggle to keep running as though someone was right behind me, even if I was alone at that point in time, and didn’t know the status of the other racers. This type of race forces you to rely on your gut. There are so many decisions that pop up along the way and there is no time to waver. Some of the choices were small – such as, should I run on the right or left side of the road to get the tangent? And, some big – such as, should I run in front of that cab driving at 60mph? 9. What did it feel like to turn the corner on Ludlow, seeing the finish up ahead? What was going through your head? Did you know you were in 2nd place at that point? Immediately, I was just relieved to see that I had gotten back on the right street after taking the Manhattan Bridge back over to the LES. I was unsure up until seeing the Ludlow street sign. When I did see the finish line, I had the typical end of race thoughts – relief, excitement, and fatigue. The spectators cheering and numerous camera flashes from all angles made the finish even sweeter. I was pretty sure that I was in 2nd place, but, again, had no idea what moves had been made. 10. Will you be back next year? If so, where do you hope to be in terms of your fitness level compared to this year? What will you do differently to prepare – having the experience of one Midnight Half under your belt? I definitely plan on coming back to the Midnight Half again next year. I’m (obviously) hoping to be fitter. Prior to the race, I hadn’t really done any structured training runs or workouts, but I was fit enough due to mileage alone. There’s definitely more than enough room for improvement, though. I plan on running the route at least once and biking it again, to ensure total confidence and eliminate room for error. 11. Compared to other races you have ran, how does the Midnight Half compare in terms of difficulty, gratification and importance to you? The Midnight Half is definitely up there in terms of difficulty, gratification, and importance –more so than I had anticipated going into it, for sure. I kind of had the preconceived notion that it was more of a “fun run” (those words together make me cringe, but that’s the best way to describe it), but was wildly mistaken. It’s a race that deserves the utmost respect and preparation. Completing it brought upon the same feelings that finishing a major race does. By the way, the after party lived up to expectations. It may not have been the best idea to stay until 2am, since I had to be in Scranton, PA to walk at my college graduation at 8am the next day, but I don’t regret it in the least. 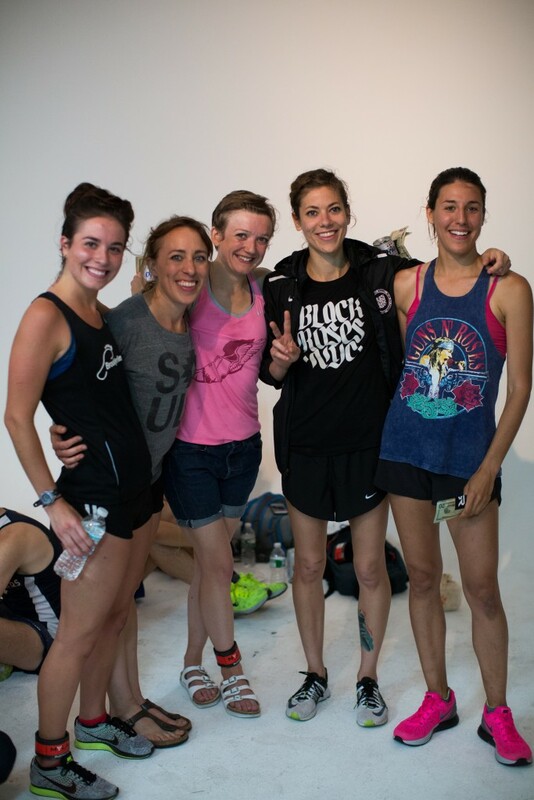 The top 5 females from the 2015 Midnight Half from left to right: 2nd Place Female Cara Notarianni (1:26:41); 4th Place Female Darcy Budworth (1:32:13); 5th Place Female Hannah Stower (1:33:06); 3rd Place Female Leigh Gerson (1:29:17); 1st Place Female Jennie Cohen (1:25:00). Image by David Trimble.